Flat feet occur commonly in children. In fact, flat feet are considered a normal part of childhood development over the first 7 years of a child's life. This is mainly due to the way that the bones of the legs, the tibia and femur develop at the knee joint. 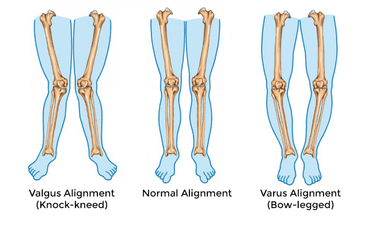 As these bones grow, they cause periods where children are bow legged (genu varum) and knock kneed (genu valgum). When these postural changes occur, feet compensate by rolling in or out in order to maintain balance. Most commonly, children between the ages of 2 and 7 tend to be slightly knock kneed, with flat feet as a result. During this time, the bones of the feet are also undergoing changes. Just as the bones of the legs grow and change, so do the bones of the feet. When a baby is born, the bones of hte feet are predominantly made up of cartilage, rather than hard bone. Each of the bones in the foot grow and harden at different rates, with full maturation only occurring in the teenage years. As such, the flexible nature of the foot in young children further increases the likelihood that children will have flat feet in younger years. It should be noted here that muscles also take time to grow and develop. Muscles tend to grow in response to use. As children become more and more active, and develop coordinated movements, their muscle strength will improve, which will then improve their foot posture. It is important for parents to check their children for signs of excessively flat feet. The reason for this is that young children are unlikely to suspect or identify flat feet on their own. Besides visual inspection, parents should notice whether or not their child trips or falls alot, struggles with basic movements, or complains of pain. In many cases there is no need for treatment for children with flat feet, especially if the cause is genetic or developmental. However in some cases treatment may be required to facilitate normal activity. In the cases where there is no need to treat, we often advise parents on making sure their children wear good shoes and develop good strength in there feet. However, if a child is experiencing pain, then shoe inserts, calf stretches, and physical therapy may be considered. By around the age of seven, we expect children to finish this developmental phase, and have fairly normal alignment in their hips, knees, legs and feet. If you are unsure about whether or not your child's feet are considered normal, or if you feel that their flat feet have not resolved, you may wish to consider taking them to a podiatrist to get checked out.